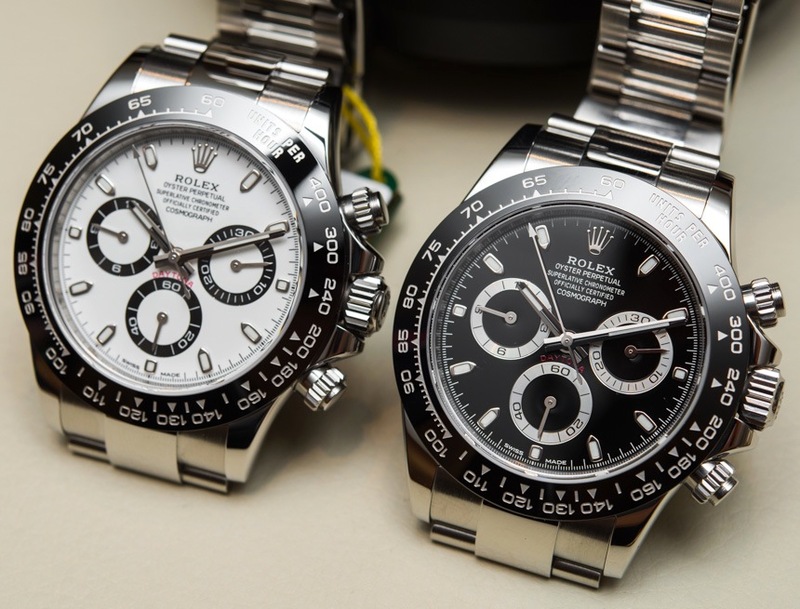 The Daytona’s case measures 40 mm in diameter and is made in Rolex’s distinctive Oyster style and has a water-resistance of 100 meters (330 feet). Its water resistance is helped by the use of a winding crown fitted with Rolex’s patented Triplock water-resistance system which screws down securely into the case. The fluted caseback is also (hermetically) screwed down with a special tool exclusive to Rolex watchmakers and the chronopushers also screw down too. A crown guard has been integrated into the case middle which has been machined entirely from a solid block of 950 platinum and has a polished finish and is complimented by a bracelet also in platinum. 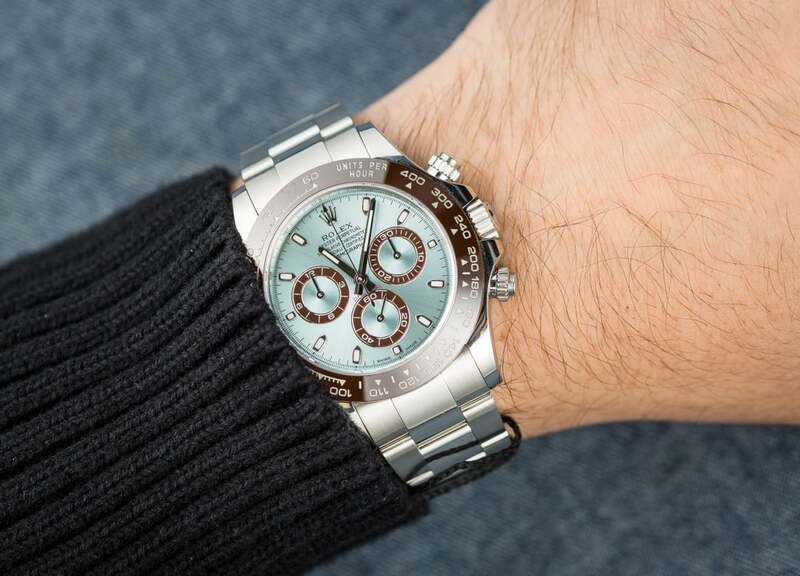 One of the Daytona’s signature design elements is the tachymeter bezel which adds to its auto racing persona, used in conjunction with the chronograph it measures average speeds of up to 400 miles(or kilometers) per hour. The tachymeter has engraved numerals and graduations coated with a thin layer of platinum via a PVD, and Rolex’s proprietary Cerachrom material is an extra-hard, corrosion resistant ceramic – Cerachrom is a contraction of the words Ceramic and Chrome. The “Ice blue ” dial is a colour reserved exclusively for platinum models in particular the Day-Date II. Contrasting the ice blue of the dial the outer scales on the chronograph subdials are made of chestnut brown lacquer which compliment the bezel, they have 18k white gold borders. White gold has also been used for the applied hour markers and hands which have a coating of Chromalight, a luminescent substance with a blue glow that Rolex claims lasts longer than eight hours. The 2018 Couture luxury-watch-and-jewelry show kicked off in Las Vegas today, and WatchTime is on the scene to cover highlights from the array of timepieces being shown there, some being seen in the U.S.A. for the very first time after their launches at Baselworld or SIHH, others all-new releases rolled out since the two Swiss watch fairs. One of the former is the new Longines USA Exclusive HydroConquest, which we glimpsed unofficially in Basel but can now offer a full reveal on as the models make their official debut. 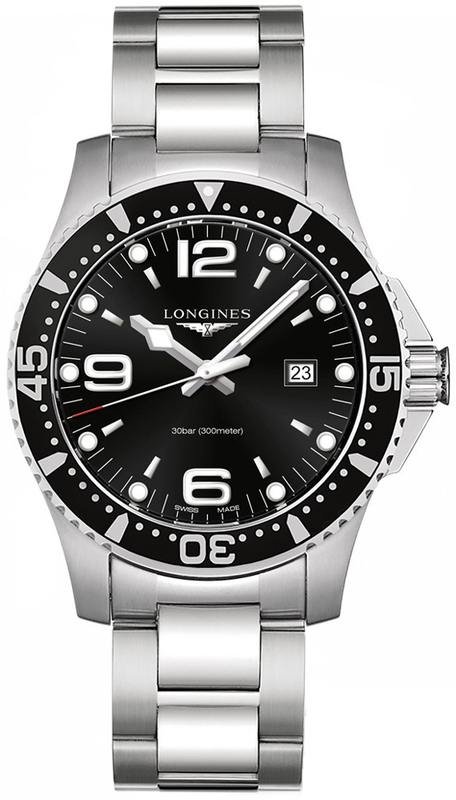 The collection, an extension of Longines’ popular HydroConquest series of sporty dive watches, consists of three editions, all sold exclusively in the United States and limited to 1,000 pieces, which feature subtle American-inspired detailing. The color options range from traditional stainless steel to stainless steel with a black or gray PVD coating. The dials come in sunray-finished black, gray, or bright blue, with red indexes, a small “USA” script in the bottom right corner, and a luminous 50 in the upper left corner of the bezel in honor of the 50 states of America. For divers, the important information is that the watch boasts a 300-meter water resistance, a ceramic unidirectional bezel, anti-reflective coating on the crystal and the choice between a NATO strap or a stainless steel bracelet with the integrated divers’ extension. The Super-LumiNova-coated hands and hour markers contrast starkly with the dials; the date appears in a window at 3 o’clock.